The record is made up of 1 file (260 folios). It was created in 30 Dec 1936-24 Sep 1946. It was written in English and Arabic. The original is part of the British Library: India Office The department of the British Government to which the Government of India reported between 1858 and 1947. The successor to the Court of Directors. Records and Private Papers. volumes. Copies Nos. 88 and 89. 2. (a) Interdepartmental Cypher and Decypher 1941 in two volumes. Copies Nos. 1564 and 1565. Copies Nos. 1274 and 1275. Nos. 112 and 157. And Indian Cypher and Decypher "S 11 1945 in two volumes. Copies Nos. 211 and 212. (d) Two sets of Indicating Groups for use with India Office The department of the British Government to which the Government of India reported between 1858 and 1947. The successor to the Court of Directors. (e) Two sets of Indicating Groups for use with India Office The department of the British Government to which the Government of India reported between 1858 and 1947. The successor to the Court of Directors. 4. Indian Confidential Code and Decode "Q" 1935 in two volumes. Copies Nos. 156 and 182. 5. (a) One time Recyphering Pads "IN" only (Cairo - Bahrain) No. 6 -10. (b) One time Recyphering Pad "OUT" only (Bahrain - Cairo) No. 415. (e) India Office The department of the British Government to which the Government of India reported between 1858 and 1947. The successor to the Court of Directors. Six Way Pads Nos. 1 - 36. Code 1935. Copies Nos. 112 and 157. 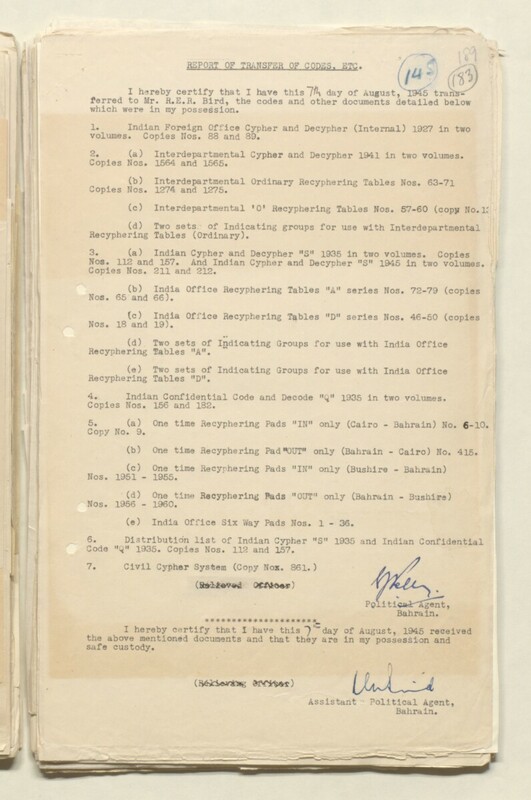 Foreign Office memorandum on the production of official documents, 1942. The Arabic content of this file consists of printed text on the verso The back of a paper sheet or leaf. of the sketch map on folio 81. This sheet appears to have been reused for drawing the map. The papers are arranged in chronological order from the front to the rear of the file. Serial numbers written in blue and red crayon (blue for sent correspondence, red for received correspondence) are present throughout the file. They refer to entries in the notes at the rear of the file. Foliation: the foliation sequence commences at 1 on the front cover and terminates at 258 on the back cover. The numbers are written in pencil, are enclosed in a circle, and can be found in the top right hand corner of the recto The front of a sheet of paper or leaf, often abbreviated to 'r'. page of each folio. Foliation anomalies: ff. 1, 1A; ff. 3, 3A; ff. 53, 53A; ff. 185, 185A. A second incomplete foliation sequence numbered 53-250 is also present between ff. 52-245. The numbers are written in pencil, but are not circled, and appear in the same position as the main sequence.